Living in an AONB, child friendly? “They’re not allowed to go down this hill, it’s an Area of Outstanding Natural Beauty” said the National Trust volunteer to my children. Mountain boarding down the steep hill by Hive Beach in Burton Bradstock did not go down well this weekend. “Go on mate, you go and tell them to stop having fun” said the husband. “I will” replied the man his hand on the gate, adding “If we let them do it then there will be loads of them. And it’s wet, so they’ll do some damage, they’ll make a path and it’s an Area of Outstanding Natural Beauty” – in case I didn’t hear that the first time round. “I know it’s an AONB. 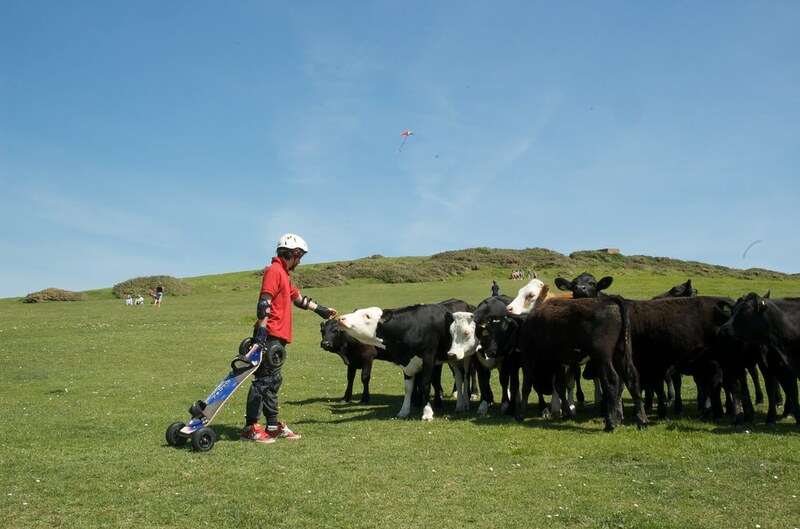 We live in an AONB, most of Dorset is an AONB, does that mean they can’t mountainboard anywhere? And it’s dry actually.” I added, throwing my hands up in the air in despair. “I don’t get it but if that’s the way you feel, by all means go and ask them to stop doing their sport.” and I walked off in a huff towards the Spring Tide Festival. I know I shouldn’t get cross with the man, he is a volunteer and does what he has been asked to do by the powers that be. Who makes these unwritten rules anyway? What’s the logic behind forbidding children to ride down a hill that only cattle, walkers and dog owners use. Should we live in West Dorset as if it was an old fashioned museum where people need to whisper and “Do not touch”? The National Trust have been trying to shake their image of old houses and mothballs. Just look at their marketing: families, walkers and youth on their front covers. That’s the way it should be. The National Trust is for all of us, children included. Who do we keep our national heritage for? NT do a great job in West Dorset looking after a large part of our amazing coast. Still our Jurassic Coast crumbles and falls. Nature does that, not children. On the other hand, it was OK on the same day to have dozens of cars and vans come to a Food and Craft Festival. Now, don’t get me wrong, Spring Tide is a great festival. I have been a regular visitor to the event ever since it started, stocking up on fantastic food. Today, I thought I’d take my kids. In fact they came -with their boards- a couple of years ago and it wasn’t a problem. Thing is, there’s only so long my children will spend in a tent filled with food whilst I chat to stall holders and spend money. Mace the Bodger is great but my kids have watched him turn his green wood many times, he’s even taught them. Ben and his local National Trust team are brilliant but my boys’ interest in fossils is minimal unless they’re on a beach hoping to find a hidden treasure. 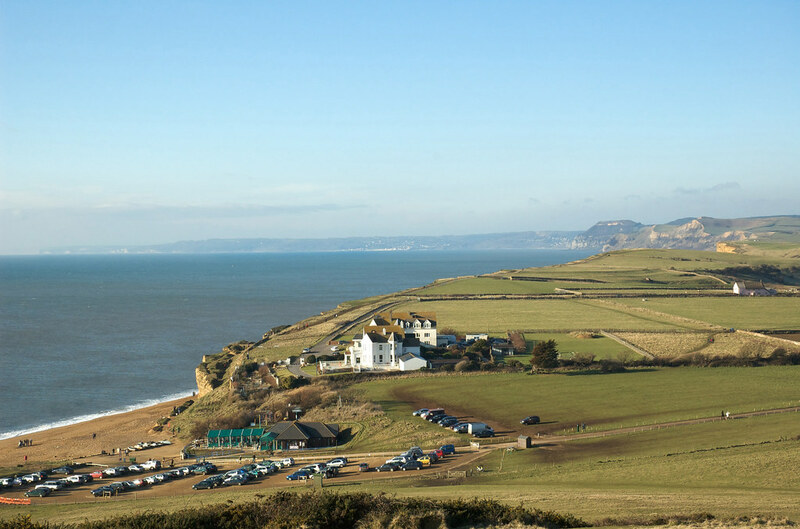 If you stand on top of that forbidden hill, you have a magnificent view towards Golden Cap and Lyme Regis. At the forefront, a car park and a cafe with a plastic canopy. Some might say these are an eye-sore. Now again, I have nothing against The Hive Beach Cafe. They are a renowned West Dorset eaterie that champion local food, equally sought after by seafood seeking weekenders and grey haired locals after a cuppa, an ice-cream or fresh crab. If you’re a non-smoker you’ll love the fact that smoking is even forbidden outside. Being the baddy that I am -irresponsible mother of mountain boarders and a smoker- I was told off last year for lighting up on the open terrace. What a bad family we are. What I want to understand is this: if it’s ok to have car fumes and plastic canopies on National Trust Land, why are local members of the Trust (via a family membership) not allowed to enjoy a harmless sport on the side of an empty hill. If you don’t know what a mountain board is, imagine a skate board with bigger wheels. Imagine a kid with lots of padding and a helmet in case they fall, as it is a bit of an extreme sport when they get serious. When I say harmless, I mean harmless for the hill. We went on a dry day, there would have been no wedges of soil unearthed. The volunteer was worried they would create a path. There are paths already, created by walkers, many with dogs, some leaving fouling behind. In fact there is one of England’s most popular Coast Paths a few yards away. Thousand of people have treaded its soil, along the crumbling coast. There are ‘off-paths shoots’ everywhere close to eroding cliffs; were they created by weird sports people or kids?. It is a privilege to live in an Area of Outstanding Natural Beauty. It beats cities any day in my books. It is our duty to look after our corner of the world for our descendants. How do we ensure our future generations want to help preserve it, love it and respect it? By telling them they can’t use it for their sport whilst their parents and grandparents fill it with car fumes and we all look at huge petrol tankers up and down the Coast? I’m not suggesting motor cross competitions along the South West Coast path or car rallies up and down the West Dorset lanes. My kids love downhill biking and mountain boarding. They may look like scary bikers with their full face helmets and padded bodies but I cannot believe the looks of suspicion from several people this weekend. How old are these kids? 11, 12 and 14. Maybe we should leave everything absolutely untouched. But let’s remember, this hill -as the rest of the Chesil Beach Coast- used to be a forest before our ancestors turned them into fields. The damage of evolution is not a recent thing. Let’s bear in mind both Dorset AONB and The National Trust talk about healthy living and sport. Quite right too; our western kids may be the first generation that die younger than their parents due to a lack of sport (and poor diet). So who makes these rules of what sport can be enjoyed where on National Trust, Area of Outstanding Natural Beauty or Unesco listed parts of the world? Heaven forbid we might stray from walking or maybe cycling on cycle lanes. I wonder, would our Mesolithic ancestors -who used to have huge festivals a few miles away at Hambledon Hill- have a problem with a few children enjoying the side of a hill at seemingly high speed? I have a feeling they’d think it’s a great idea. With a few rules of course: don’t frighten any cattle, stop when you see a walker, respect your elders, behave responsibly and go and have fun. If only. If cows don’t mind kids, why should people?